Q:Will I receive a proof of the sticker with my logo before processing? Also, will you notify me if you think the words in the logo are too small for the sticker? A:Yes, a proof will be sent to your email before the order is produced. You will also be notified if the words in the logo are too small. Chocolate can only be shipped via 1-Day or 2-Day Shipping. Please select the $7.50 cooler fee for all chocolate orders being delivered between May 1st and October 31st. We will not be responsible for melted chocolate.Dark purple Hershey's Kisses is dark chocolate and the gold has almonds. Give your clients and colleagues something to savor with these logo-branded Hershey's Kisses. The perfect party favors, these personalized chocolates make great accents to corporate events and holiday parties. 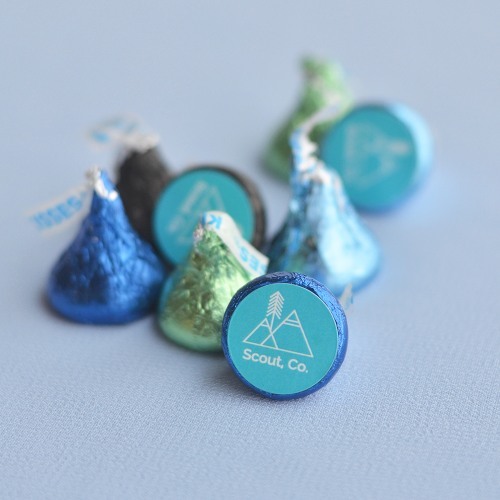 Complete with silver foil wrapping and a signature Hershey's Kisses flag, each chocolate arrives with the personalized label already affixed to the bottom. No assembly required, and shelf life is approximately one year. Please submit your custom artwork in one of the following high resolution image file formats: jpg, tiff, png, eps, ai, pdf, psd, bmp. Note: vector artwork is preferred and makes for a sharper, higher quality image. We will determine the best size and location for your artwork, and submit a proof for your approval. For a sweet favor guests will love, pack some of these Hershey's Kisses in sheer organza bags or in square favor boxes tied with personalized favor ribbon.